Evernote can store multimedia files as attachments to notes (e.g. photos, scanned documents, text, audio). I initially thought of using Instagram or Tumbler for images but I didn’t want to have to use yet another app and am not sure I want to write live fieldnotes in the way Tricia Wang does. I’m not tied to one device. I can download the Evernote app to my laptop, smartphone, iPad, and PC at work and sync files across them all. Evernote data is stored locally on my devices and in the cloud. I could jot notes straight into Evernote (or email them to my Evernote email address) with my smartphone or iPad and develop them further on my laptop later in the evening. I haven’t done this yet as I’m more of a pen-and-paper kind of notetaker in the field, although I always have my phone or iPad on me (the iPad is great for distracting my nearly-3-year-old while I’m trying to do an interview). I have started taking photos of my handwritten notes and emailing them to Evernote with my phone, which I work on later on my laptop. I can tag my notes in Evernote. This is a great way to organise information. My fieldnote template, for example, is tagged ‘ethnograpy’ and ‘fieldnote template’. I’d add more tags depending on the project and content. 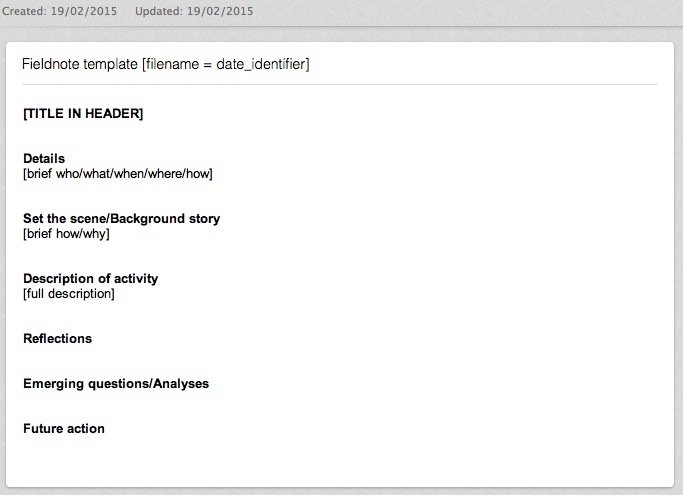 Evernote notes are searchable. MS Word is too, but I find the search engine clunky. If I ever decide to upgrade to the Premium version of Evernote, I’ll be able to search inside PDFs and other documents as well. I can encrypt selected text with a password in notes. I might eventually have to pay to become a Premium Evernote user ($6.49 per month, or $55.99 a year). At the moment I use the free version which has a monthly upload limit of 60MB. I haven’t yet gone over that limit but could easily do so if I started attaching voice recordings to fieldnotes. There’s also the question of security. Michael Hyatt researched Evernote’s security policies and concluded his data was safe, but I still need to consider the possibility of hacks and might end up anonymizing my fieldnotes before uploading them to Evernote. I’m keen to hear about other electronic systems researchers use to take and organise fieldnotes. Do you use Evernote? I would love to hear from you! Posted on March 11, 2015 June 18, 2016 by lorenagibsonPosted in Anthropology, Fieldwork, ResearchTagged ethnography, fieldnotes, fieldwork, notetaking. Glad to hear you are trying it out! I became a premium user when I started using Evernote for fieldnotes. I now also use it for teaching, especially since I started using prezi which doesn’t have a little box to type your lecture into. So I write my lectures on evernote and also store any relevant readings and websites and emails from students on there tagged to the course code! I also anonymize my fieldnotes as I write. Hey there! I’d be curious about an update. How have you found using Evernote in this way — and was it helpful (or did it pose any challenges) once you got to the stage of analyzing your data? I’m about to embark on my dissertation research; I’ve ben a heavy Evernote user for quite some time and am wondering if I should continue for fieldwork or do the “multiple Word documents” thing.